The CreditWorks Group wanted to upgrade their aging website with a powerful business website that is SEO friendly, Mobile Friendly and with clear lead generating funnels. 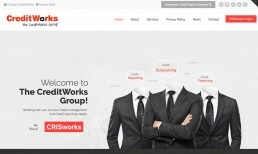 We provided CreditWorks with a clean, industry focused website that not only turns heads, but is highly functional. We also delivered a fully responsive website along with google focussed requirement such as Schema info, AMP ready and an installed SSL cert to comply with Google security focus.